Lake Saint Louis, Mo., Nov. 20, 2018 — NISC’s web and mobile app, SmartHub, along with several Virginia-based NISC Members were recognized by the Virginia Energy Efficiency Council for contributions to energy efficiency. 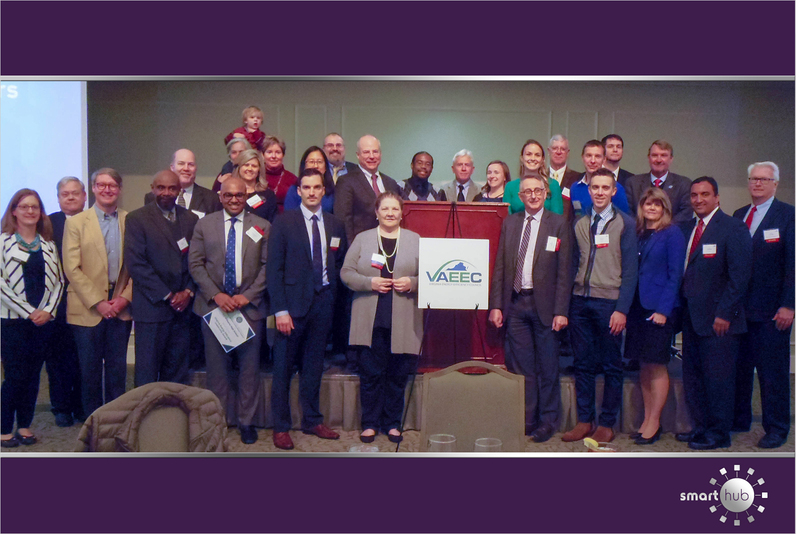 SmartHub, along with A&N Electric Cooperative, Community Electric Cooperative, Mecklenburg Electric Cooperative, Prince George Electric Cooperative, Southside Electric Cooperative and Rappahannock Electric Cooperative, were presented a second-place award in the Residential category at the 2018 Virginia Energy Efficiency Leadership Awards luncheon Nov. 14 in Richmond, Va.
SmartHub is a customer engagement web and smartphone app for NISC Members’ consumers that provides an easier way to pay their bill and monitor their energy usage. To Rappahannock Electric, one of the award recipients, this has meant increased efficiency and enhanced customer communication. According to the Virginia Energy Efficiency Council, the Energy Efficiency Leadership Awards recognize energy efficiency champions across the Commonwealth that are helping businesses, government, homeowners, and schools save money on energy expenditures while reducing energy consumption – all while stimulating job growth and the economy.